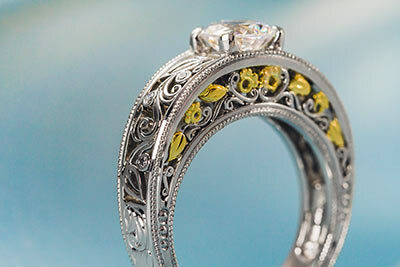 Perhaps the widest - and most ambiguous – style found in the Green Lake Collection is that of ‘antique or vintage.’ These are pieces that exhibit vintage motifs, classical settings, and fine old world details like hand engraving, milgrain, and delicately forged filigree. Various other motifs and periods, such as Art Nouveau & Art Deco can be mixed with these to form hybrid styles that look kind of vintage, but are not actually representative of any specific time frame or artistic movement. 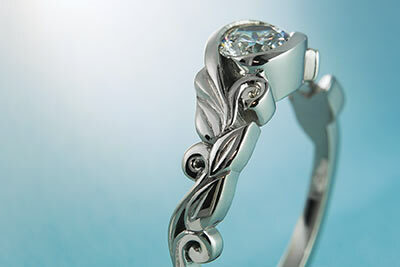 Art Nouveau expresses the natural world with romanticized forms, undulating curves, and a ‘whip’ like line style. 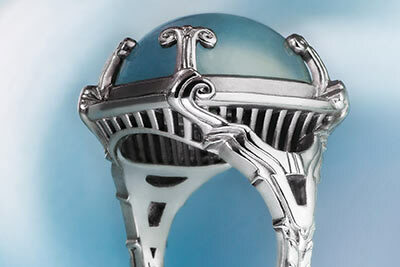 From flowers and birds to mythical beings, an Art Nouveau piece freezes a moment in time. 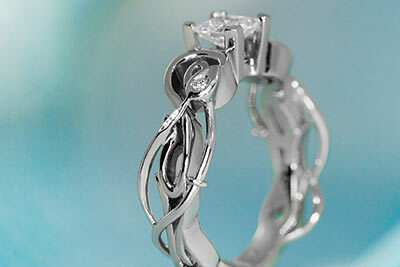 When creating a piece in this vein, elements of hand forged filigree is almost a must. 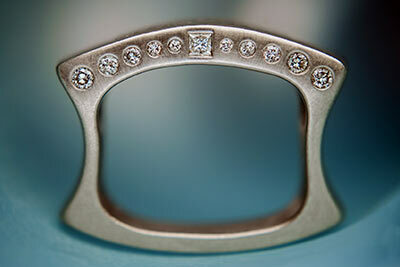 Art Deco style jewelry is recognized for its use of bold symmetry and geometric patterning. Thematic inspiration drew from ancient Egypt, Greece, and Rome. The sharp lines, division of space, and use of large gemstones within many pieces of this genre inspire recreations that are almost architectural in nature. Contemporary jewelry diverges away from the gratuitous ornament associated with estate pieces and focuses instead on framing the natural beauty of gems with clean design and modern shapes. There are no rules to abide by with contemporary design, the options are limitless. With all of the wild curls and whimsical turns nature surrounds us with, organic style rings pull inspiration from anywhere and everywhere. 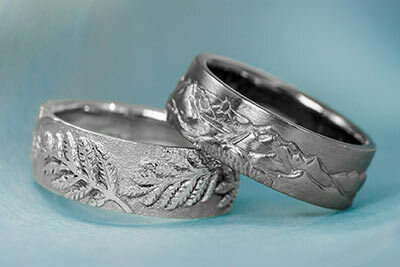 Be it waves, vines, leaves, or clouds, interpreting the natural world with metal is very much an area of distinction for Green Lake Jewelry Works. 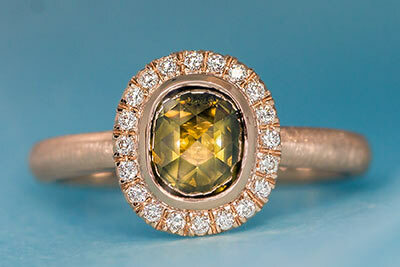 See our expansive collection of organic & Curvy styles for inspiration! If you’ve climbed to high peaks or experienced a deep connection with nature, your ring maybe the perfect place to commemorate it. Whether it’s a specific mountain range, a sentimental flower, or homage to the sea, Green Lake’s artists are uniquely capable to capture it perfectly in a piece to last the ages. This collection features a range of rustic textures & finishes, as well as rough & rose cut gemstones to achieve a very rustic, down-to-earth aesthetic. With precious materials appearing closer to their natural state, RingHammer defies traditional notions about ‘perfection’ yet maintains a terribly chic appeal all the same. 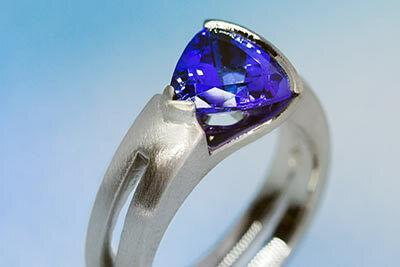 Abstract rings seek to re-imagine what a wedding ring should look like and how it should feel. Green Lake crafts many abstract rings unlike anything available from a traditional jeweler – metals in colors never seen, rings that move, and elements never thought possible to incorporate.